Here at MCS Networks we don’t do anything small. When we built our first diagnostic and repair lab in 2007 with one goal in mind, be able to service as many customer PC’s as possible without being overwhelmed to the point where our quality of service drops below our customer expectations. 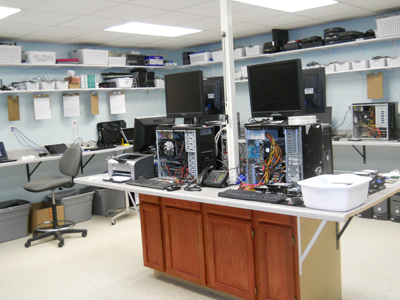 In the fall of 2012 we built our current diagnostic and repair lab which is configured to service up to 18 PCs and/or laptops at one time. When we designed our lab we built 3 concurrent isolated networks to allow us to diagnose customer’s computers in a protected environment from other PCs we are working on. We keep a lot of commonly used parts to repair PCs including power supplies, cooling fans, bios batteries, networking components, and PC component cards just to name a few.